My small L-shaped bed was great for throwing in sticks and grass and leaves among the larger branches that formed the edges. 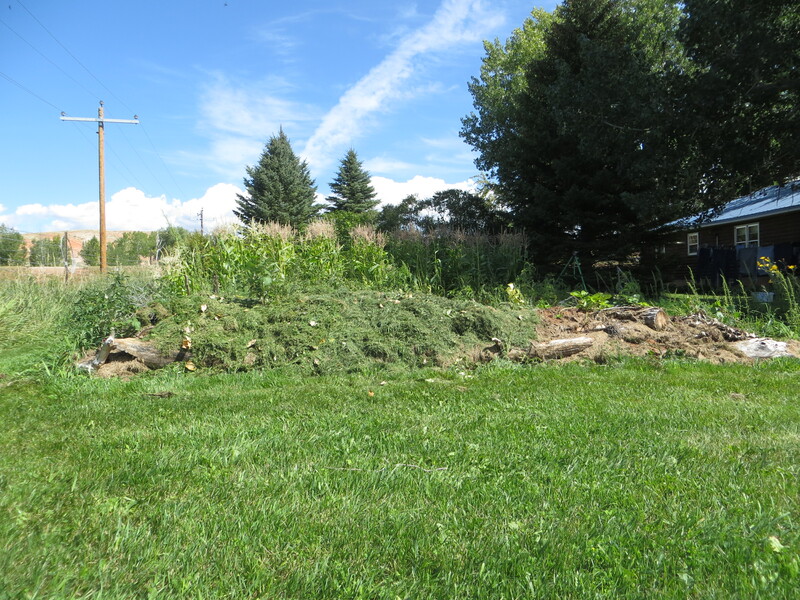 I threw on some garden waste… and more limbs (after every big windstorm! ), and more grass. I had it built up quite a ways. It never really seemed to do too much… the grass would dry up and shrink some… it wasn’t very “active”. This spring, Victoria and I hauled out some compost from that pile down by my studio, and poured it on top. It wasn’t that much really, I think we hauled only 10 5 gallon buckets or so. Then I was going to continue adding grass, etc. to it this summer. With all the rain we’ve had, I only actually bagged my lawn clippings a couple of times. 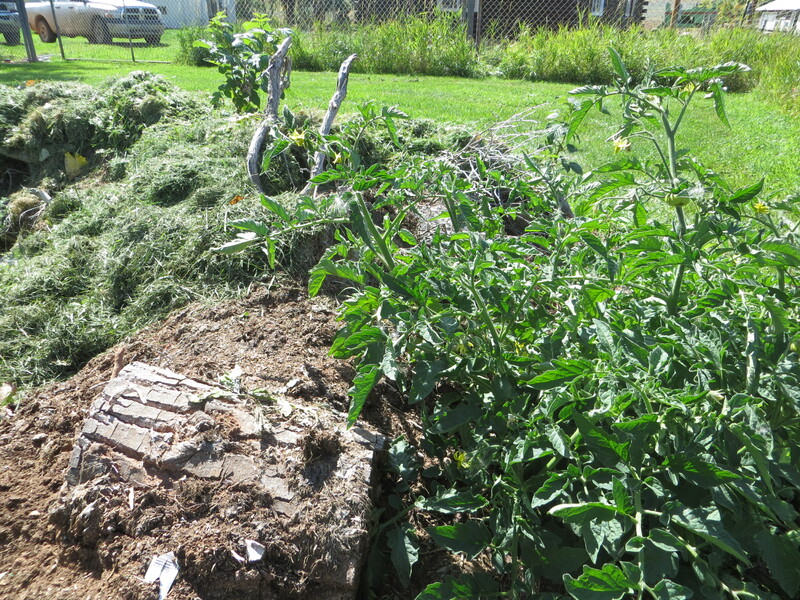 That was the trick though, the compost kicked it into gear, and the bed has shrunk, decomposing and creating fertile ground. This end of my bed has shrunk dramatically. It’s difficult to make out since my garden is behind it, but I added another layer of grass on top on the north end today! I had volunteer tomato plants. They are VERY healthy, but they got too late of a start to do too much. I’ve had a few weeds, but they’re a cinch to pull! I never threw weeds on this, including my first grass cuttings that had too many dandelion seeds in it! They go either in the compost or just over the fence! 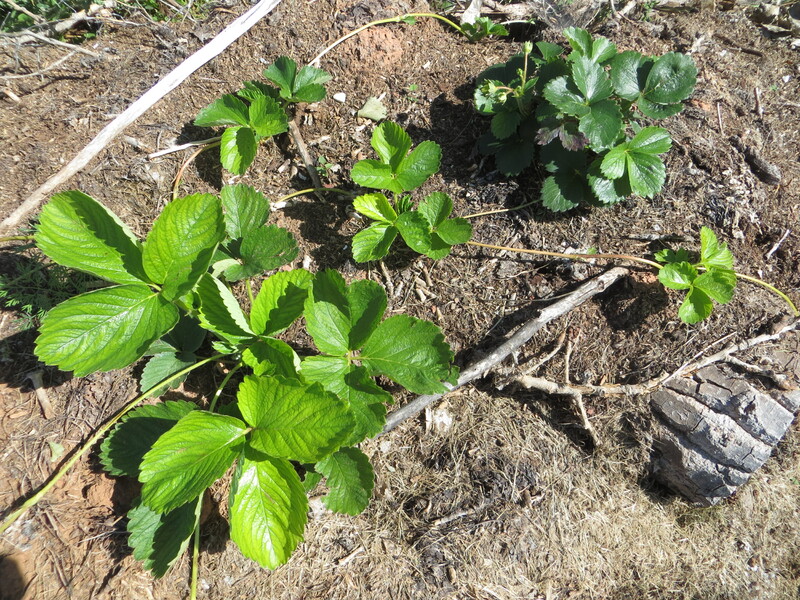 These strawberries love it… again, looking much healthier than the ones in my strawberry bed. While at my brother’s earlier this summer, I snagged a few raspberry bushes… and while I lost a few to that intense heat we had for a while, the surviving ones look fantastic. Hopefully, they’ll overwinter well, and next summer will have them multiplying! 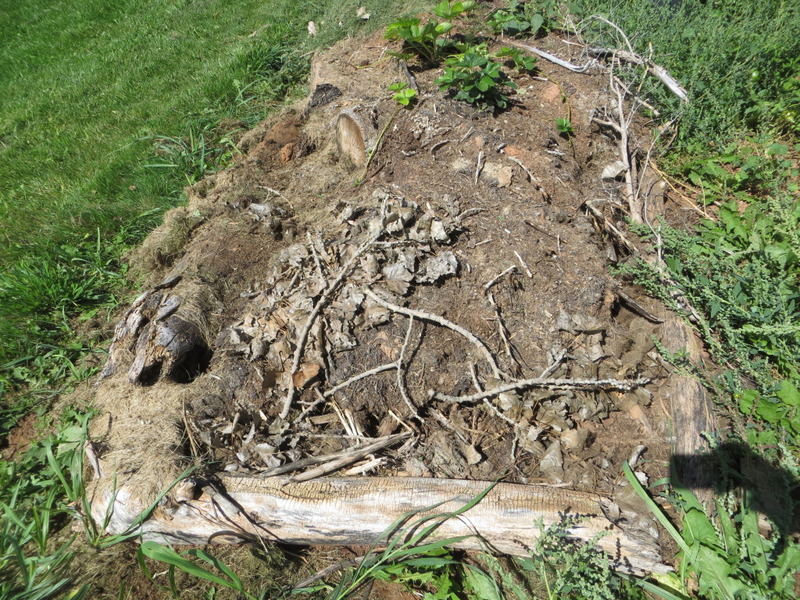 This bed received waterings just like my garden, so I can’t testify to its quality for water retention, but I’d say it’s soil health, even though its “soil” is sticks, leaves, grass, and fine layer of compost dirt, is VERY healthy. I’m going to add to it… building it up as it shrinks… and I think I’ll expand it as well. 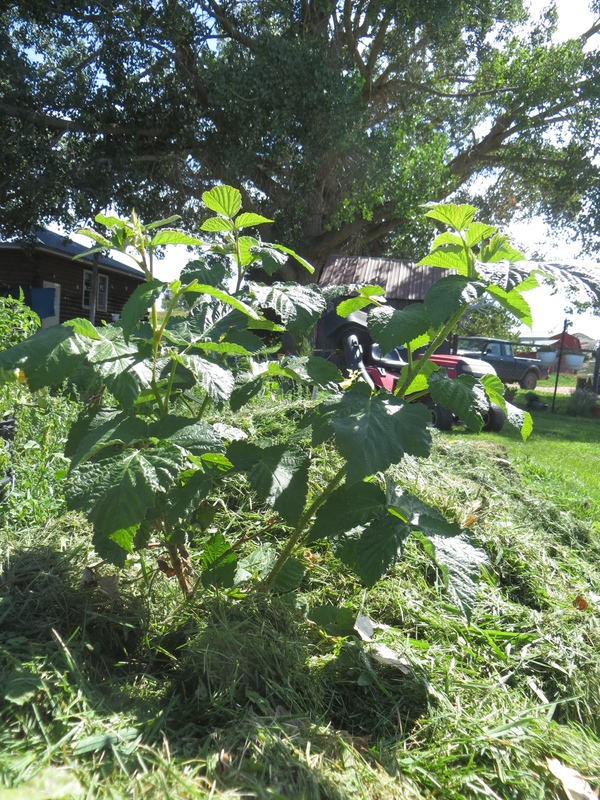 I want this to be a great raspberry patch, so I’ll add more of them in the spring. Having raspberries there will add to its windbreak capabilities. I may stick a few tomatoes in it too, if the health of these plants is a hint, it may be the perfect place. I can see how this would be great UNDER your flat garden. Brandon is putting a layer of hugelkultur in his raised beds he’s building, and I think that’s a Grand Idea! Questions??? I’m collecting them, and I’ll answer them in a few days! Post ’em here. Is Lucas’s sore foot still doing better since you treated it awhile back? Thank you, thank you for the Hugle Culture report, so want to try it myself. The plants do look really really happy.